When I buy shoes, I think about the outfits I’ll wear them with. When I buy an outfit, I think about what shoes will go with it. In fact, nearly every time I see an outfit I like on a mannequin, I look to see if they’ve paired it up with shoes… just to get an idea as to what I should buy. Traditional print catalogues have been great for showing shoppers the whole ensemble. Sears comes to mind immediately. And even J. Crew, which sells shoes, accessories, and clothing, has recently started selling Timex watches in their print catalogues — assumedly because people like to buy coordinating pieces and feel confident that they’ll look stylish… even if style doesn’t come naturally. 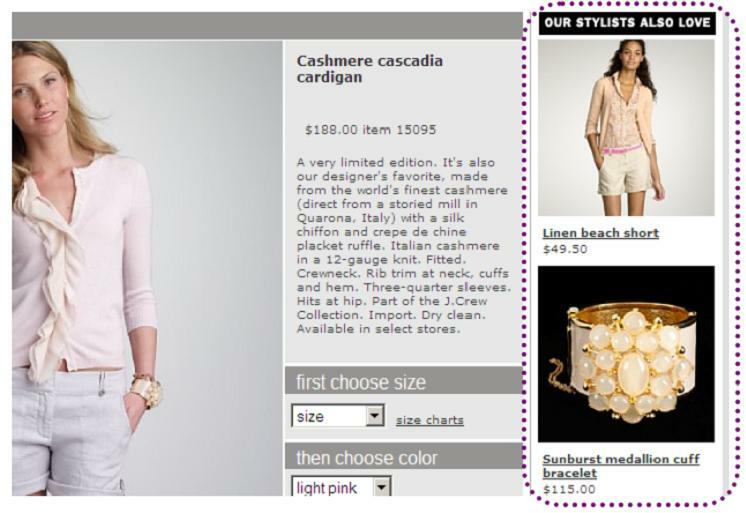 Maybe that’s why Anthropologie.com has a “Buy This Outfit” function on their site. Because there are a lot of moving pieces to creating an outfit, and it can be hard for one person to determine which pieces go best with which others. Stimuli overload! 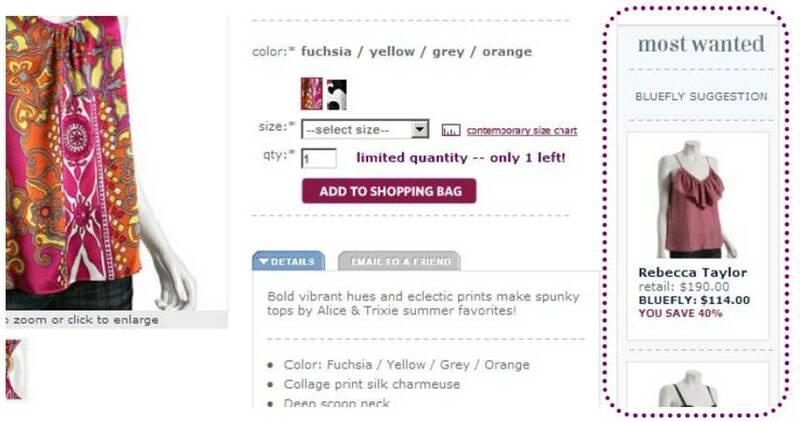 What happens to online shoppers when they’re faced with lots of information? Huang, Chung, and Chen (2003), referencing other studies and their own, argued that information overload online creates enormous challenges for customers during decision-making… and that intelligent recommender agents can help customers overcome those challenges. Recommendation systems assess what a customer is currently viewing online or has purchased in the past and work a little behind-the-scenes magic to recommend additional purchases to them. The goal of intelligent and simple recommenders is the same: To help users make more purchasing decisions more confidently on an e-commerce site. The beauty of recommenders is that they are one more tool to help time-harried shoppers, users overwhelmed by information, and users lacking the ability to judge the quality of a product make the decisions they want to make. Who’s using recommenders to sell more product… and who’s not? Well, Amazon’s obviously the king of recommenders, as shown in the screenshots above. But I’m not shopping on Amazon right now. No, right now, I want to buy a new pair of pumps… so I’m heading over to Piperlime. For those who like to shop for clothes, Piperlime is great because it’s actually 5 sites in one: the Gap, Old Navy, Banana Republic, Athleta and Piperlime. That means just one checkout process (one shipping fee, one account setup, one credit card entry) for a range of clothing shopping needs. We love it! Given that there are so many outfit + shoe purchasing opportunities on Piperlime, we fully expected the site to have a recommender agent of some kind. Even a simple one. ‘Cos it’s a great cross-selling opportunity… and what marketer doesn’t love those words? We arrived on the site. We found some great heels and, on the product detail page, all sorts of awesome social proof in the form of user ratings and reviews. Then we added the shoes to our cart and expected to be met with “customers who bought these shoes also bought this bag” or “these shoes look great with this dress from Banana Republic”. …But we got nuthin’. No, we were sent directly into the cart to create an account… with nary a recommended cross-sell to bump up the average sale price. This lack of recommender represents a persuasion opportunity for Piperlime, Gap, Old Navy, etc., which are already doing great things with social proof. 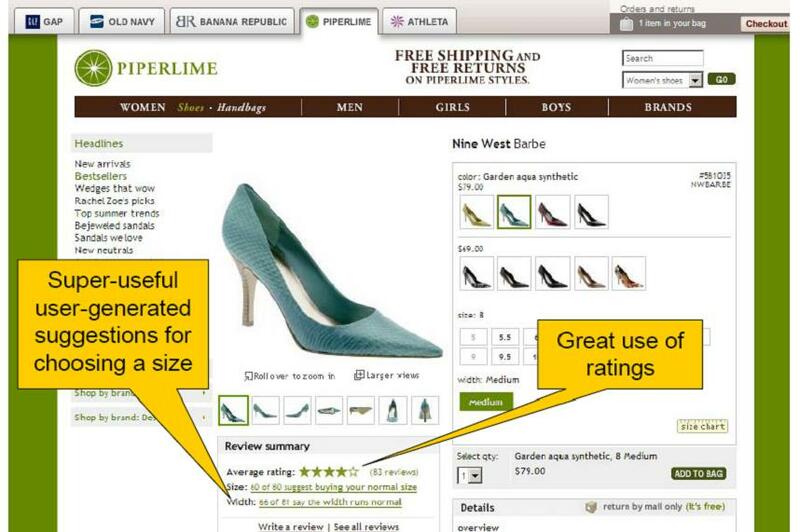 User testing could help determine if recommenders would feel too salesy to users. And an A/B test could also help determine if recommenders on Piperlime lead to any sort of lift, especially today when some might argue that people lack the disposable income to even consider additional purchases. Those etailers — and others! — must hypothesize that recommenders help users… and the business. An A/B test could help reveal some insights there. The truth is that recommenders do help users make more confident purchasing decisions. They also persuade users to buy items the might otherwise not have considered. All with the data you’ve probably already got. So use ’em!